This video tutorial takes you through the basic steps of setting-up and using your Magnetic Moves chart. 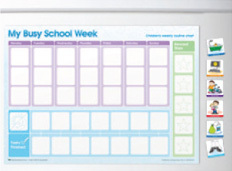 You’ll see where to place the charts, how to use the magnets and how children can interact with the charts to move through their routines and organise their day. This step by step guide explains how easy our charts are to use. These steps show how our charts are used and highlight the basic features that all our charts have in common. Magnetic Moves charts are designed to be placed on a metallic surface. Place the A4 magnetic chart on any metallic surface, such as a fridge, dishwasher or a magnetic board. The high quality protective finish on our charts and tiles make them easy to wipe clean.Now that your chart is in place, carefully remove the activity and reward tiles from the pop out sheet supplied, Magnetic Moves recommends this be done by an adult. You can place the activity tiles around your chart, making them easy to see and swap around as required. Now it’s time to start using your chart by selecting the activities for that day or week.Place your selected activity tiles on the chart. This can be done with your child at the start of the day or something that can be done the night before in preparation for the next day. However, doing this with your child, gives them a sense of ownership and responsibility. 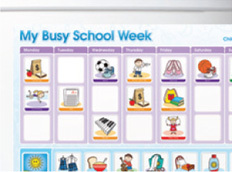 This will help keep them interested and involved in the process.My Busy School Week has a section for weekly activities as well as daily activities. The daily activities can easily switch between morning and evening by changing the sun tile to the moon tile and adding the appropriate activities. At the start of your day, look over the chart with your child so they can see what their day or morning entails.Once your child has completed an activity or task they simply move the tile to the task finished or done section. This enables them to see what they have done and what they still have to do while also giving them a sense of accomplishment.Since both the chart and the tiles are magnetic, the tiles will easily slide from place to place over the protective gloss finish of the chart. 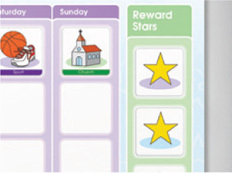 All Magnetic Moves activity and routine charts include a section for rewards.Use the star tiles to reward good behaviour throughout the day.